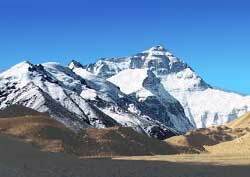 Mount Everest - whose summit is crossed by the border between Nepal and Tibet, China - is the world's tallest mountain. Commercial expeditions can cost climbers $60,000 to $75,00 each. More than 200 climbers have died. A few of them scaled the Mount Everest peak but met their demise during the descent. Certainly, challenge and prestige are two answers. Another is "Because it is there", as famed mountaineer George Mallory stated. In 1953, Edmund Hillary and Tenzing Norgay became the first humans to scale Mount Everest. Some say two climbers accomplished this feat in 1924, but the evidence is weak. More than 2,000 people have successfully reached the summit. A blind person, a double-leg amputee, a 15-year- old, and a 70-year-old have successfully made it to the top. And other adventurers have skied, snowboarded and hang glided down the mountain.